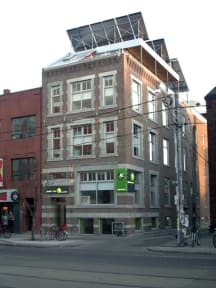 Definitely the best hostel in Toronto. Great atmosphere, the best people, everyone is really open: no telephone zombies. Location is good. Staff is friendly. We got free trick or treat candys and the host a lot of events. Would recommend to anyone! I love this place! At first I wasn’t really happy with my room because I was the only girl in a room full of guys. But i went to the front desk and they changed my room immediately! I would definitely stay here again! Super fijn hostel, aardig personeel, schoon, goed ontbijt, eco-vriendelijk en een geweldig dakterras met uitzicht over de stad! I really enjoyed my stay at this hostel. The staff was amazing: joyfull and helpfull. The facilities were perfect. Especially the kitchen and sitting area were my favorite. The upstairs area with a view over toronto was amazing aswell. It was such a good atmosphere within the hostel: friendly calm and loving. The location around the corner of Kensington Market was perfect too. I will defently be coming back. Super locatie. Ontbijt was goed en keuze genoeg. Slaapplaats was goed en tof dat de badkamer in de kamer is, zodat je niet met een hele vloer moet delen. I had an incredible stay here at the hostel, honestly cannot recommend it enough. 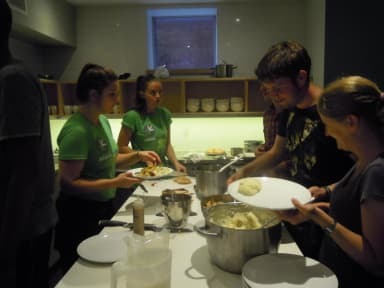 The staff are super friendly and helpful and the hostel itself is very clean and perfectly located. The only thing I have to remark is that it can be a bit annoying that there isn't any staff between 12 and 7 am, so if something happens or goes wrong you have to wait til 7am for them to arrive. Other than that I had an amazing time and would definitely stay here again! Best hostel I have stayed in so far (and I’ve seen quite a few). They have thought of everything you might possibly need! Locaties is great too; close to Kensington market so perfect for going out. Social activities make it super easy to meet people! Vriendelijk personeel, prima sfeer! Eenvoudige slecht geventileerde, zeer gehorige kamer, (een (krakend) stapelbed, een kastje, géén stoel, raam kon niet open) waarin we alles meekregen van het nachtelijk 'plezier' van de buren en weinig nachtrust genoten. Overall I liked the hostel: it was clean, in a great location and every night the hostel organised events. There was only one thing that I could not help but notice: the amount of people (there really were a lot) who weren't there to travel but who were on a working visa and trying to find a job. This made it more difficult for the average backpacker to get into contact with fellow backpackers to go out and do something.